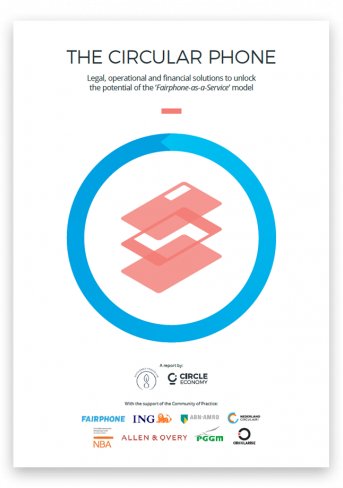 A Community of Practice, with Circle Economy, Fairphone, Sustainable Finance Lab, PGGM, ING, ABN AMRO, NBA, Allen & Overy and Circularise, present a practical toolkit for Product-as-a-Service models. Presenting solutions that bridge the gap between businesses and financiers. Using Fairphone as a leading example, the unique interdisciplinary consortium was able to break through the financing pitfall surrounding the circular business model and shares a legal Circular Service Contract and a financial cash flow tool to support Product-as-a-Service models. PaaS implies a growing balance sheet and a high working capital demand while returns evolve over a longer timespan. It is therefore difficult to interpret with the current financing, legal and accounting standards. Follow our financial guide to develop a cash tool for PaaS models. PaaS involves a contractual agreement between the service provider and the client (compared to one transaction in the case of a regular sale). Following our open-source ethos, we present a contract template to support PaaS initiatives. Make your business circular by learning how to implement a Product-as-a-Service model and attract financiers. Our financial cash flow tool enables businesses to get a grip on the numbers and create a circular business proposition. Interested to apply our modelling tool to your business? Get in touch with us to learn more!